“All right, let’s make up some crap,” Colin Mochrie, Canadian improv expert said to his partner in comedic crime, Brad Sherwood, at the beginning of the Colin Mochrie and Brad Sherwood Show Friday, Dec. 13 in the Honeywell Center’s Ford Theater. “At no point during the show do Brad and I know what’s going on,” reassured Mochrie. The shenanigans which ensued proved Mochrie to be honest. Both Mochrie and Sherwood are veteran members of the British and American versions of popular TV show Whose Line is it Anyway? The show consists of the crew taking audience suggestions to perform improvised skits. This stop on the Two Man Group Tour makes it the fourth time the duo has performed in Wabash. Dawn Patrick, owner of Modern Impressions, is the first business owner to take advantage of the North Manchester Fa�ade Improvement Program recently created by the town council to assist building owners in restoring the exteriors of their downtown establishments. The local program is one of two fa�ade improvement opportunities that are currently ongoing in North Manchester; the other involves a grant the town received through the Office of Community and Rural Affairs (OCRA). Town officials first applied for the OCRA grant approximately three years ago, but prior to that they had received a design grant, which is when downtown building owners interested in participating could sign-up, according to town manager Dan Hannaford. “We had 17 buildings included in that process originally, but Scott Zook (owner of Zook’s Caf�) has since dropped out of it because he did a lot of the work on his building himself,” said Hannaford. “I talked to all of the other building owners just last week and the architect is coming back around Dec. 12 or 13 to finalize everything for the construction phase – bids have to be out in March and the actual construction should then start around May. The Indiana Historical Society (IHS) is pleased to announce that the North Manchester Historical Society (NMHS) has been named a winner of the 2013 Indiana History Outstanding Event or Project Award for “The Year of the Opera Curtain.” NMHS received the award during IHS’s annual Founders Day event on Dec. 2, at the Eugene and Marilyn Glick Indiana History Center, located at 450 W. Ohio St. in downtown Indianapolis. While you are out and about trying to find those perfect gifts for family and friends, remember the animals at the Wabash County Animal Shelter. As a non-profit entity, the shelter, located at 810 Manchester Avenue in Wabash, depends upon donations for all aspects of its operation. Wet and dry dog, kitten and puppy food is a daily need, as is cat litter. The shelter asks that no donations of dry cat food be given at this time since there is an abundance of it at the moment. Dog and cat treats give the animals something special to enjoy; toys help keep them active and interested. Donations of bleach, liquid laundry soap (no dry), hand sanitizer, paper towels, mops, brooms, dust pans, and Dawn dish soap help the staff keep the facility clean and the animal healthy. Office supplies such as copy paper, stamps, envelopes and gift cards that can be used to purchase ink cartridges help cover office operations. Donations can be dropped off at the shelter during operation hours or at a donation box located inside Big R.
Shaun Eiler has been teaching Wabash High School’s shop programs for the past seven years. He is a Northfield High School graduate, who attended Ball State University, always knowing he wanted to be a teacher. “My grandfather was principal at Roann High School. Growing up, I always had people telling me stories about how he impacted their lives. I wanted to impact lives like that. I have always liked serving people,” Eiler told The Paper. Math and English weren’t his strongest subjects in school, but he always enjoyed building things. Two teachers who influenced his life were his Ag teacher, Jeff Smith, and former shop teacher at Northfield, Doug Koch. “Smitty showed even when you’re learning something you can have a great time doing it. So I’ve tried to make these shop classes something the kids enjoy so they get excited about taking shop,” said Eiler. Eiler believes in teaching the students basic construction skills that they can use in the future. Scheduling makes it difficult to cover every construction topic available, but Eiler focuses on teaching students how to build doors and window frames, do basic electrical wiring, and make sound structures. Larry Curless, long-time affiliate of the Honeywell Foundation, will retire at the end of December after 34 years of service. A reception to celebrate and honor his contributions to the Honeywell Foundation was held in the Honeywell Room on Wednesday, Dec. 4. Curless began his career with the Honeywell Foundation in 1979 by first serving on the Board of Directors and two years later was appointed treasurer, serving in that role from 1981 to 2001. During this time he participated in the “Miracle on Market Street” groundbreaking ceremony for the new Ford Theater addition. Wabash County Habitat for Humanity proudly announces election of its new Board of Directors Officers for 2014. Board President Roger Tate passed the gavel, appropriately a framing hammer, and leadership of the Board to Randy Duhamell at the Dec. 10 meeting of the Board of Directors. Newly elected officers include; Dan Early as Vice President, Jim Finnell as Treasurer, and Jocelyn Ravenscroft as Secretary. The Board also recognized the dedication and service of retiring Board Members Lewis Curless and Jack Eads. The Wabash County Habitat for Humanity Board of Directors includes; Curt Campbell, Dean Dawes, Curtis Campbell, Gloria Elzroth, Karen Halverson, Lynne Margolies, Bob Schmalzried, Maxine Warford, Arturo Yanez and Brad Yoder. Habitat for Humanity is a nonprofit Christian Ministry that provides affordable homeownership opportunities to low-income residents of Wabash County. Habitat Partner Homeowners purchase their homes from Habitat through a no-profit zero-interest mortgage. Habitat volunteers work alongside the future homeowners in the construction of their new home. Habitat is in the process of preparing and raising funds for the 2014 building season. Just weeks after the Metropolitan School District of Wabash County announced its decision to close LaFontaine Elementary School, Wabash City Schools Superintendent Jason Callahan proposed a similar plan for his district. 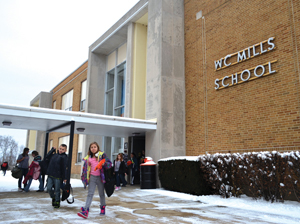 In January, the Wabash City School’s board will vote whether or not to close W.C. Mills Elementary School, which holds grades four and five for the whole district. Mr. Callahan presented the plan to reconfigure the district during Monday’s school board meeting. The new plan proposes that fourth grade students move to OJ Neighbours Elementary School and fifth grade students move to Wabash Middle School making the district a three campus district of K-4, 5-8 and 9-12. Before Mr. Callahan’s proposal, EMCOR gave a presentation on their feasibility study on heating and cooling for all three campuses in the district. The group also looked at additional structural repairs W.C. Mills would need as far as windows and doors. According to their study, the project would cost $3.2 million for the updates. OJ and Wabash Middle School need $1,814,000 in updates. It came as no surprise to Mr. Callahan that W.C. Mills is in need of major updates. “About six years ago, I was working on my superintendent’s license, and one of the projects I had to do was a facility feasibility study,” Mr. Callahan told The Paper. “I had to look at all the buildings in the corporation and how old the facilities are, the present condition of heating and cooling, roofs, paving and all those things that go into maintaining a facility.